Its been a busy week at work and whatnot but also in mentally preparing myself for the biggest bake I've ever done. Persephone's wedding cake! Flick and I are pretty honoured to be making a giant stack of brownies for the special day tomorrow. So whilst my kitchen is filled with countless trays and kilos of chocolate, I've just squeezed in some time to make a birthday cake for my Stepdad. 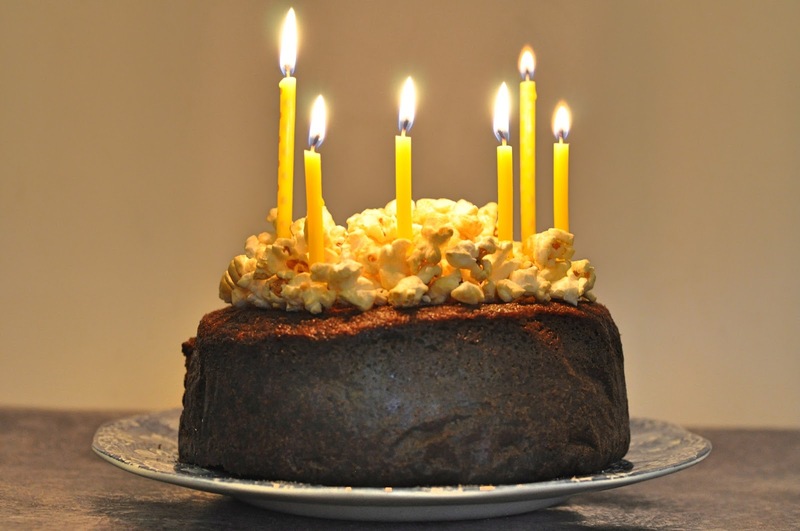 I'm slightly envious of his bonfire night birthday, the perfect time for a big ginger cake and some fireworks in the garden. (We'll forget the year a Catherine wheel set the garden gate on fire!) So whilst I'll be wearing my dancing shoes and shimmying around during P's reception, I'm sending this cake over in my absence. 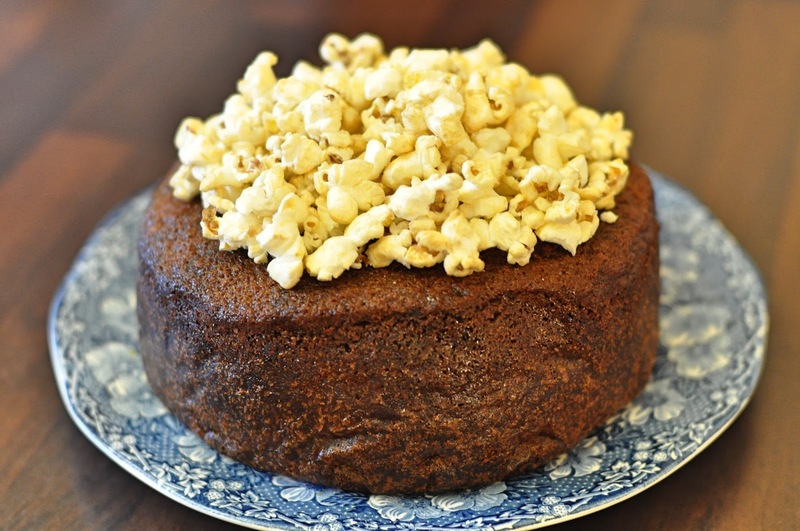 A super tall, sticky ginger and golden syrup cake, soaked in more golden syrup and topped with sticky toffee popcorn from Popworks. There's heaps of sparklers for the top for tomorrow night, but for now I've improvised! Heat the oven to 180 degrees and grease and line a deep 6 inch round cake tin. In a saucepan over a medium heat, melt the golden syrup, butter and sugar together until smooth. Remove from the heat and leave to cool. Add the ginger, milk and eggs and stir together. Place the dry ingredients into a large mixing bowl, make a well in the centre and pour in the wet ingredients. Fold the mix together and pour into the prepared tin. Bake for 50-60 minutes, until golden and a skewer inserted into the middle comes out clean. Mine started browning on the top half way through so I popped a foil hat on. Once baked, remove from the oven and pour over a generous dollop of golden syrup, smoothing over the top. Leave to cool in the tin for at least 10 minutes before turning out onto a wire rack to cool fully. Yummy cake!! It is mouth-watering. Want to have similar adorable cake for my party at one of LA venues. Thank you so much for sharing this recipe. Will surely have it for the event. It looks so delicious and will be loved by all my attendees.